The historic Berlin and Potsdam based House of Hohenzollern produced nine kings who ruled the Kingdom of Prussia, and three emperors – who carried the post-1871 title ‘German Emperor’ – from 1701-1918. This dynasty played a pivotal and extremely influential role when it came to shaping the politics and history of central Europe for over two centuries. Every Prussian King or German Emperor was either named Friedrich or Wilhelm; or together, Friedrich-Wilhelm (obviously this family lacked a ‘how to name your baby’ book in those days). Without a doubt, Prussia’s most significant ruler sat on the throne for 46 years from 1740-1786, ingeniously using Prussia’s army to bring large territorial gains to its kingdom and to mold Prussia into a European powerhouse by the time he passed away #OTD, August 17, 1786. 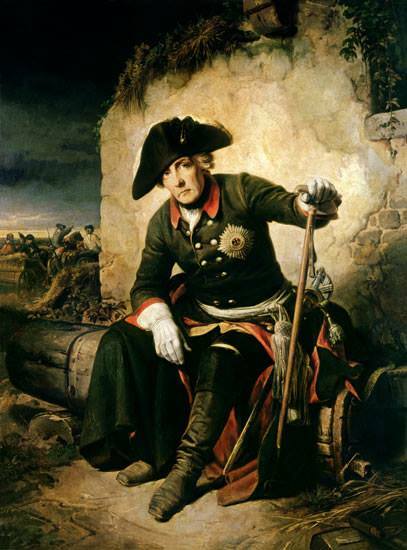 Born in 1712, he was raised under strict military discipline and was dominated by the overbearing, aggressive, and decidedly obnoxious personality of his father – the “Soldier King” – Friedrich Wilhelm I, who had no sympathy for Frederick’s sensitive character or his musical and intellectual pursuits as a young boy. 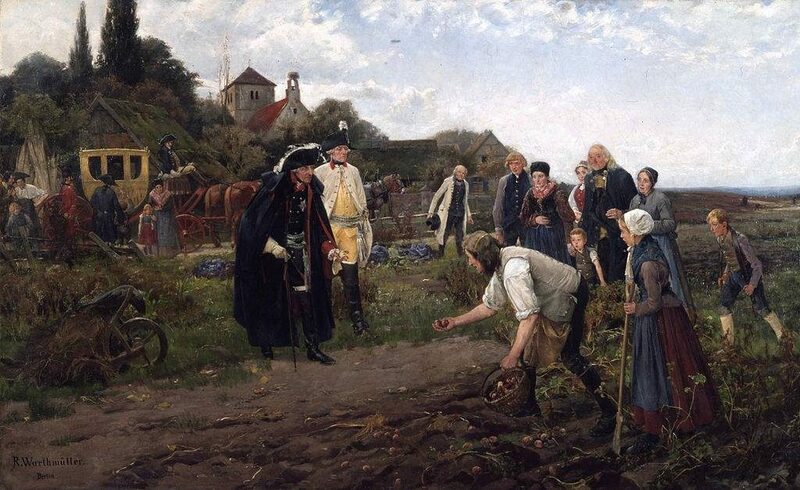 To save his own life, he reconciled with his dad, the King, and obeyed his orders to marry a lady named Elisabeth Christine of Brunswick-Bevern (whom his dad had chosen for him), and moved 40 miles north of Berlin to the city of Neuruppin where he was able to take command of his own regiment. In the end and after all that mess, the result was that he’d brilliantly and successfully turned Prussia into one of the most powerful kingdoms in Europe, and had ultimately laid the foundations of Prussian imperialism which would be achieved less than a century later in 1871. Frederick, the enlightened ruler, who preferred to see himself as the “first servant of the state,” built his charming Sanssouci Palace on a terrace of vineyards in Potsdam in 1747. Here, he passionately played his flute, collected art, and debated philosophy with prominent guests like the writer and philosopher Voltaire. Yet, it was here at his beloved Sanssouci that “Old Fritz” – as he was commonly referred to as later on in life – passed away at the age of 74 – 232 years ago today. Contrary to his will, his mortal remains were buried until 1944 in the Garrison Church in Potsdam. After a tumultuous odyssey during WWII, his coffin was laid to rest at the Hohenzollern Castle in southwest Germany for nearly forty years. 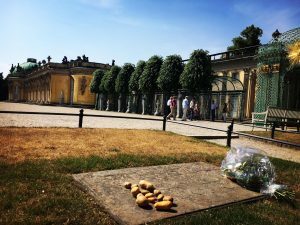 Finally, on the 205th anniversary of his death #OTD, August 17, 1991, his wish had finally been granted, and his coffin was laid to rest in the crypt on the terrace at Sanssouci that had been made for this purpose during his lifetime. With potatoes normally decorating his grave (“Der preußische Kartoffelkönig” or “Potato King” was one of several nicknames he gained over the years for his faith in the humble vegetable that he thought his farmers should concentrate on growing), he now rests in peace alongside his beloved greyhounds at Sanssouci.